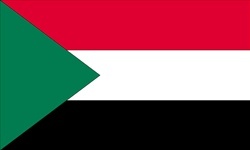 Like is the case in many other countries in today's world, the Sudanese flag is a horizontal tricolor. This tricolor displays the colors red, white and black, and also the color green by means of a triangle on the hoist side of the flag. The color red is said to represent the blood shed by Sudanese patriots. White represents peace and refers to the flag adopted in the 1924 revolution. Black refers to the name of the country. Sudan means "black" in Arabic, hence the republic of the Sudan or black. The color green represents prosperity and is in fact a common color used the religion of Islam. Consider visiting the following Web page for more information.